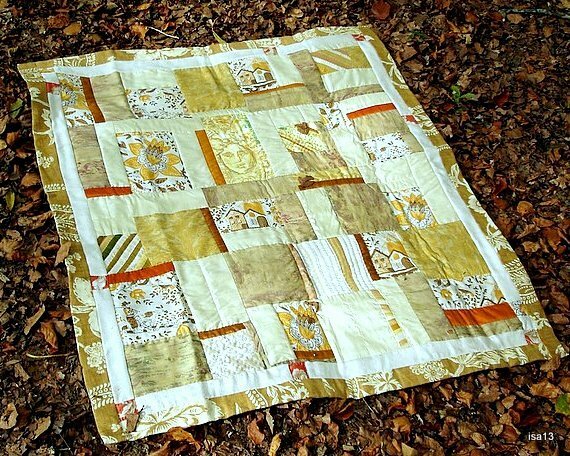 This is a quilt I like to have around when Fall comes. The walls of my home change as the seasons come and pass. 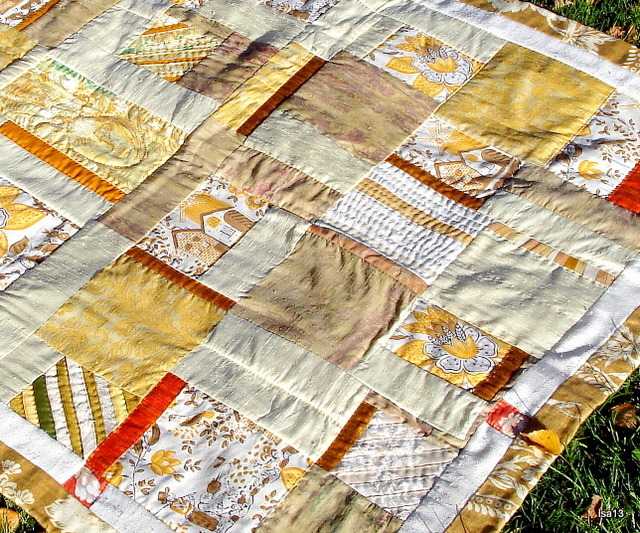 I find that the shades of this particular quilt blend in well with the colours of my surroundings: yellow, ochre, brown, green, rust. It seems to capture all the rays of a sun that has lost its Summer warmth. It is sewed mostly with precious leftovers from other quilts. 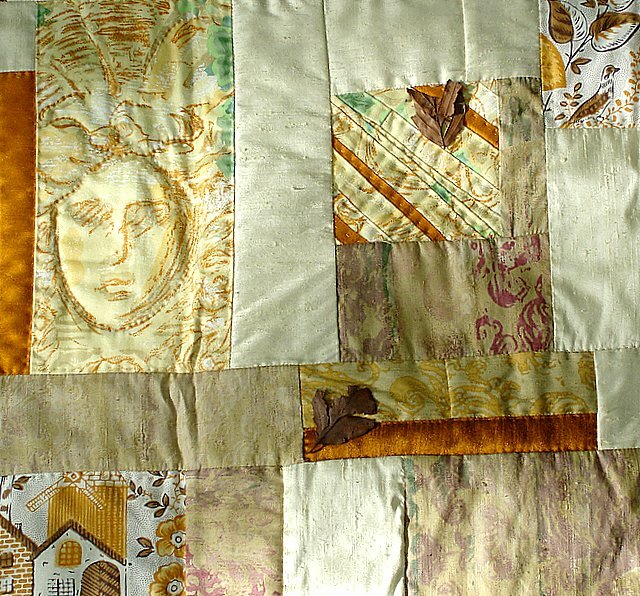 French and English ancient fabrics, various silks and a pastoral scene on linen in golden tones. The touch of these different materials is both soft and raw under your hands. The hand quilting adds a kind of uneven texture on materials that would normally be softer. 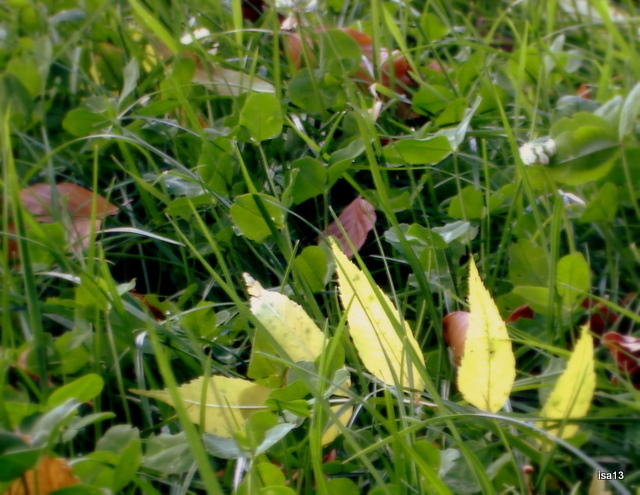 Harmony in differences. I like it for the light it brings into the house and for the movement created by the various textures. And touch them with a smile of peace”. A poem I like and whose author I do not know. 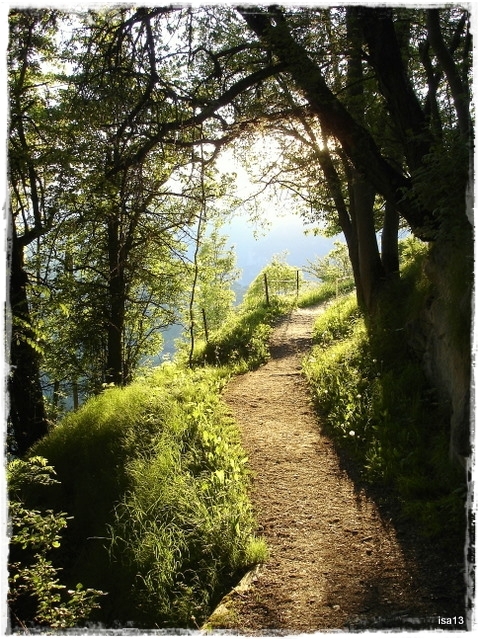 I hope it is inspiring to you as it is to me. 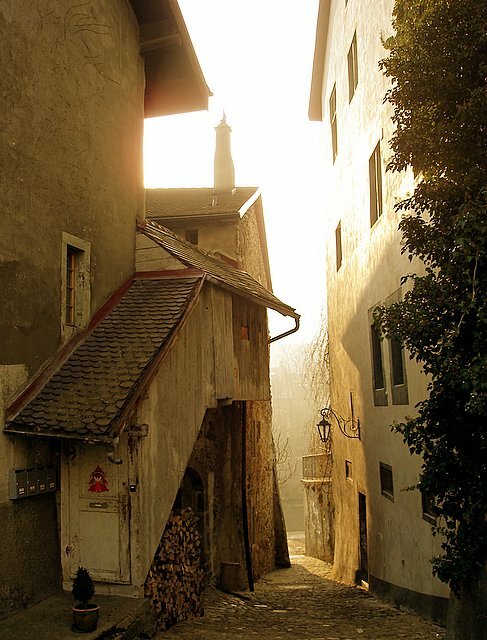 Fribourg is a medieval town (the old part dates from the XIIth century) in Switzerland. It is situated in the French speaking part of the country but very close to the German speaking area. A town of paved roads, narrow lanes borded with old houses mostly restored in the ancient style. The sunrays bring out the beauty of some picturesque ancient constructions. 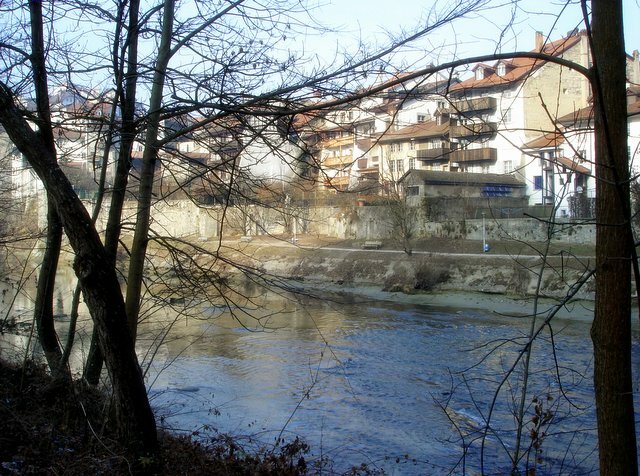 This is a town where you can walk for miles along the river Sarine which is a natural limit between two areas : Swiss French and Swiss German. 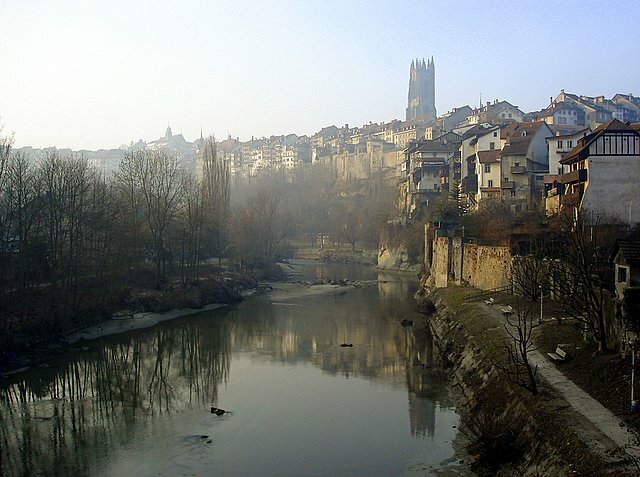 A river coming down from the Alps and flowing slowly through Fribourg, although it can be quite wild in the lower and ancient part of the town in the rainy season. 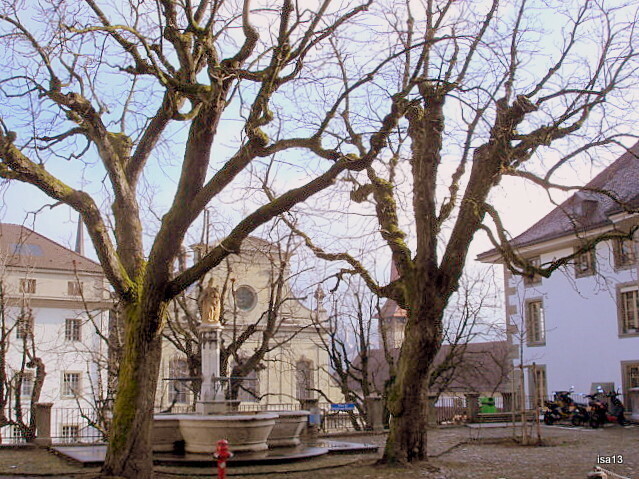 Fribourg is also a town of squares decorated with fountains of all styles. I love to sit there on a warm day reading a book or just enjoying the sun and watching people walking by. 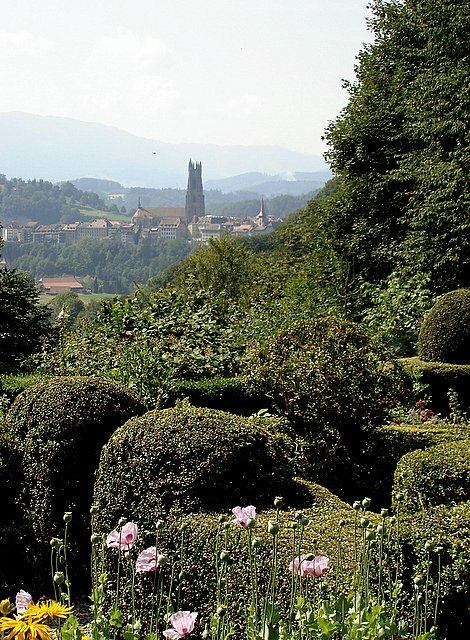 On the day I took this picture, it was freezing cold though, hardly anyone around… In Summertime Fribourg is a town where terraces bloom all over the place. A lively town which I enjoy visiting and meeting friends. These are just a few flashes of a town I live close by and which is well worth visiting if you are in the area (Geneva, Lausanne, Berne, Neuchâtel, Lucerne).